Motherhood. If ever a word encompassed multiple meanings, that’s it. Being a mother means you are so many things to your children. Their comforter, protector, kisser of boo boo’s, taxi driver, personal chef, diaper changer, the one who punishes them, wipes the tears from their eyes, loves them, and you’re there through all the good times and bad times. Motherhood can be extremely challenging at times; it tests your patience like nothing else can. But, being a mom is also the most wonderful thing in the world and is full of, what I like to call, Changing Table moments. Those special little moments with your children that make you smile and warm your heart. I remember when I was pregnant with my oldest child, a co-worker said to me, “I’m so glad my kids are past the baby stage. 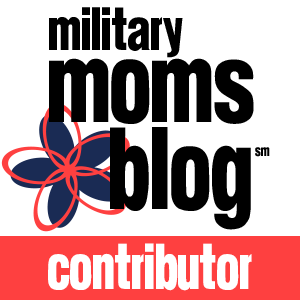 I hated changing diapers.” I can recall hearing that exact same statement over and over again from other moms throughout my pregnancy and my son’s first few months of life. That’s a very typical response you’d expect to hear when discussing diapers and, understandably so. No one enjoys cleaning a big poopy mess or getting peed on while putting a new diaper on their baby. But, despite the yuckiness of a diaper change, I actually don’t mind changing diapers. In fact, I love it. That probably seems crazy to most people. I mean, who would enjoy changing diapers? Well, I do and it’s because I don’t focus on the changing the diaper part. I focus on my baby and cherish the special moments we have together. When my 5 month old son needs to be changed, I scoop him up into my arms, lay him on the changing table and gaze into his big beautiful blue eyes. His sparkling eyes gaze up at me through his long eyelashes and dance in the light of the room. He offers me up his beautiful smile and shows off his adorable dimples. He got those from me. I smile back at him as he softly coos. He grabs hold of my arm as I change his diaper and with a playful grin on his face, leans in and tries to latch onto it. If I lean over, he grabs a hold of my hair and giggles as I talk to him and try to release his super strong grip from my curly locks. I love his giggle. It’s the sweetest sound I’ve ever heard. I’ll often leave him on the changing table a few minutes after I’m done changing his diaper just so I can play with him and enjoy our time together; just him and me. 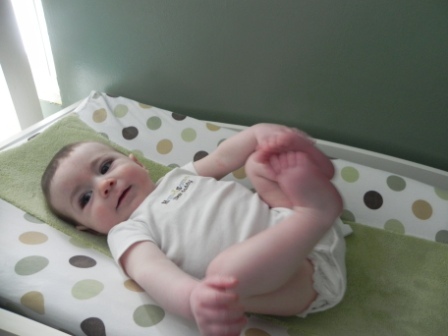 Those are my literal changing table moments but there are so many others that don’t take place on the changing table. I love watching my two boys together. It’s heartwarming to walk into the living room and see my three year old on the floor with the baby; kissing him, hugging him, talking softly to him and making him laugh. I love seeing my oldest son use his wild imagination as he plays and develops his creativity. It’s funny to hear all the things he says. Hearing the phrases, “are you kidding me?” or “Well, I suppose” come out of his mouth, make me laugh. I love how my baby automatically stops crying and smiles when I start singing to him and how his tiny little fingers grasp onto mine. I love all of these Changing Table Moments with my boys, and so many more. Sometimes I think it’s so easy to miss out on things. It’s so easy to just say, “I hate diaper changes” instead of taking advantage of that precious time with our child. It’s not always easy to stop and smell the roses. There are so many days I’d like to rip my hair out when my three year old poops his underwear instead of going on the potty…ahhh, potty training…But, I also love how he says,“I’m sorry mom. It’s not my fault,” in that cute little voice of his and how excited he gets when he actually does make it to the potty on time and screams at the top of his lungs, “Mommy, I did it! I went poopy on the potty!” Yep, I love those Changing Table Moments. 2 Responses to "Changing Table Moments"
Thanks Ranay! Feels good to be back.